We received a report of Coyote sightings from Mark Letheren from Innisfil, who said ..... I just came across two at 9:30 pm Thanksgiving evening. I live north of Big Bay Point in Innisfil, Ontario. I have two dogs, both off leash who growled. The Coyotes were just standing in the road and then trotted off towards Kempenfelt Bay. A reader from Port Colbourne, Ontario, wrote to say ..... My wife and I live in the country in the Sherkston area. It is not unusual to hear them at night. We still sleep with out bedroom patio door open. Last night, on two occasions we heard what sounded like a group of coyotes howling. The second time, around midnight, we heard them so close, we guessed they were at the rear of our property, around two hundred meters from the home. Our German Short-haired Pointer certainly took notice but I assure you, he would not have gone outside for any reason. He has a healthy apprehension when walking around our property. We occasionally see them at the rear of our property and have seen two play for about two minutes on our frozen pond. My wife loves the howling and we enjoy having them around. Lynda C Turcotte who lives in Caledonia, Ontario, tells us ..... I was laying in bed about 10:45 pm watching TV waiting for the news to come on. I heard them right out the back of the house, sounded like there were three of them and they sound close. They Yip often in the field at night. I live in Caledonia Ontario with the Hydro lines in the framers field behind the house. We are two blocks away from the river. Trevor from Guelph says ..... I was walking down the trans Canada trail towards Ariss, Ontario, with my brother at night and we heard them howling for like 5 minutes. At the end of the woods not far from us then I turned my flashlight on and there was one watching us from the farmer's field. A resident of Burlington wrote to tell us ..... We saw a large fully mature Coywolf walking down our short (6 houses each side) street towards the lake at 7:25 am. The Coywolf had no fear or skittishness at all, acting as if it owned the street. It was garbage day (Thursday) in our neighborhood. The animal approached to within 10 metres of where we were standing and then casually walked off between two houses. The location - Burlington Ontario at Lakeshore and Appleby Line (Appleby Place). We have previously seen and are used to fox, which we have seen almost daily over the past 15 years. Though they are now completely absent - we've not seen one for 2 years. 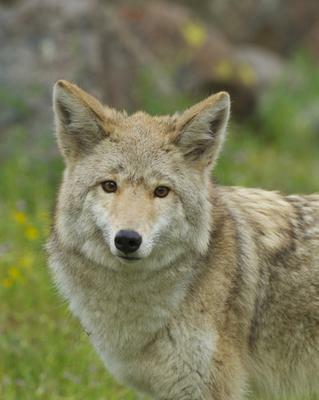 Coyotes and Coywolves are really another thing. Very disturbing to see such a large predator like this. We have very young children on our street, and some very elderly people using walkers. These elderly people are not going to be "staring down" or "walking away facing the animal at all times" from such animals, which are generally hunting in pairs. Dave from Ajax wrote to say ..... A few weeks ago, in late October, my daughter and I were driving up our street on Marjoram Drive in Ajax. We saw a lone blonde coloured Coyote taking a leisurely stroll towards the field across from our development in to the farmers field. When it finally crossed the road it stopped to look back at us and then took off in to the night. Nancy of Brampton spotted a Coyote ..... We were out to walk our Labrador on trails last night at 10 pm. We came around a bend and there he was. We turned and ran to a bridge to a busy street this took place in Brampton, Ontario. Thank you all so much for writing to tell us about your Coyote encounters. They are out there and the more educated we are, the safer we will be, and that includes our children and pets. I live on the Grand River in Caledonia, Ontario (on Sims Lock). For the past several nights I’ve been hearing a pack of Coyotes in the farmers field in front on my house. It sounds like a group of three or more Coyotes who make the most bizarre sounds. It’s fairly intimidating to be honest. Thankfully, I do not own outdoor pets, otherwise I would be keeping them indoors at night. I have what I thought was a Coyote sleeping under my back deck. Each morning that I go out on the deck he emerges and heads off. Now I am thinking he is another species as he is skinny and has a long thin tail, unlike any of the Coyote pictures I have seen. Perhaps a wild dog?? I am going to try and get a better picture of him tomorrow morning. I live in Renfrew, Ontario. Had my dog off leash and a Coyote ran towards him until I ran in his direction, yelling. Although he stopped he didn't seem too afraid as he crept towards us; just a heads up to move away from them if you spot them... and I guess keep your dogs on leash even if you think they're safe. I did live in Stayner, Ontario, for four and a half years. We use to make Bonfires at least once a week and we used to hear them at night in summer. My little dogs already knew they were out those nights and would not go out. After 4 years and a half I heard them and never seen one since I lived in Stayner, Ontario. But we did know they were around in the fields and probably watching us but maybe the fires kept them away.